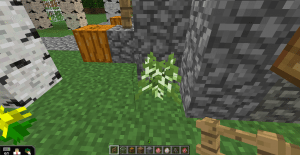 If you read last week’s post, then hopefully you have a better understanding of what Minecraft is and how it works as both a game and a source of learning and impact. Minecraft itself is a beautifully formless experience and we strive to encourage others to define it not only through looking at its gameplay but to also consider the ways that Minecraft, and other games like it, can go further, reaching areas of impact that other mediums, and even some games themselves, are unable to do. Since we’ve taken a look at the ‘what,’ we can dig a little deeper into the ‘why:’ why is Minecraft an impact game? A sustainable farm with wheat and sugar. Minecraft is, for all intents and purposes, a game that asks players to live completely off the land. The land, in turn, serves to provide everything a player needs to effectively survive and thrive as long as possible. But it is never so simple; just as in the real world, players are implicitly asked to make meaning out of the world around them. Players will come into early contact with the game’s more sustainable features through, more than likely, ‘punching’ trees to gain wood. Trees, both on their own and through the player breaking branches and leaves themselves, drop little saplings which can be placed in the ground and will grow, given a few in-game days, into gigantic trees to create a resource for more wood. Huge forests can be planted in this way, if the player so chooses, creating one of the most direct relationships between the player and a sustainable game environment as resources, in and of themselves, are limited. But sustainability encompasses much more than this in the space of Minecraft. 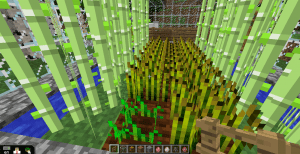 A large aspect of the game is based on farming; in total, players can farm for wheat, pumpkins, melons, sugarcane, cactus, cocoa beans, and mushrooms, as well as trees for wood. Each of these has certain requirements for their growth and cultivation, creating, to some extent, a miniature logic puzzle for willing players to take on headfirst. It is not necessarily the existence of these elements within the game that makes it so impactful, but rather, the fact that the mechanics inform the meaning. There is no aspect of the game that comes in and tells a player to plant trees, just as there are no rewards or repercussions for engaging in the action or not. The elements remain, waiting for players to come to them and make meaning from them, learning slowly the benefits, as much as the difficulties, of renewing their resources without being explicitly taught or instructed. The learning that happens in the space is personal and individually driven. Be sure to check out our blog tomorrow, when we examine Minecraft in terms of its relation to civic engagement. How else does Minecraft relate to environmental sustainability? Leave us your examples in the comments below!